When The 100 Season 4 ended, we were introduced to Clarke's (Eliza Taylor) new companion, Madi. A Natblida like Clarke, she was able to survive Praimfaya and through through will she also survived the elements. After almost 6 years of living as the last two people on Earth, Clarke and Madi's world is thrust into chaos with the arrival of the prisoner ship. 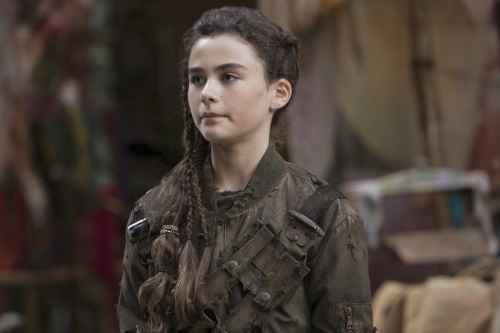 I spoke with Lola Flanery about Clarke's stories about her friends, Madi's relationship with Clarke, and about meeting new friends and foes. Clarke has told Madi these stories about her friends from before Praimfaya. Does Madi think of these characters as people? Or more as mythological or fable stories? I feel like Madi thinks of them as fairy tale characters because Clarke has mostly emphasized the magical, amazing side at this point. They are kind of like heroes and fairy tale characters. Madi only sees the positive side and the good, hero, awesome side. Is there of these people that she's heard about that she relates to the most? No. All of them in a way. They have been I feel like like Madi looks up to all of them, she might have picked up a little bit of them from the stories into who Madi is now. How would you describe Madi? What drives Madi as the last teenager on Earth? Madi's not your normal teenager of course. She is this very resourceful child, but she's still kind of confident, brave little child who doesn't really know of the things going around her. But, she does find her way and she can, because she did, survive by herself because she's that resourceful. Does she view Clarke as a mother figure? Since they are the only two last people on Earth, Clarke's not only a mother figure, but a best friend, a sister, all of them, because they are all they have. Clarke is all of it. She's everything to Madi. When we first meet Madi, we saw she did have survival skills before she met Clarke. Now she's grow up in the period of peace, how will she react to this world she's being thrust into with these enemies? Before Madi met Clarke, she was all by herself and she knew all the different things, so when the prisoners come down and all that stuff happens, there is a huge difference and shift. It's definitely a shock to Madi, but she does know how to keep herself alive and she does have those skills that she needs. It's almost as if she loses her innocence and has to do new things that she didn't necessarily need to before. Since Madi has mostly heard about the fairy tale side of these different characters up in space, there's going to be a little difference in what she sees when she meets them. She is going to meet and form relationships with Clarke's friends, but let's just say not all of them will welcome Madi with open arms. How does she feels about meeting Bellamy (Bob Morley)? Clarke did tell Madi a lot about Bellamy. I think Madi could be very excited to meet Bellamy, as she would with all of the other people, but since Clarke and Bellamy were very close I feel like Madi could be very excited to see Bellamy since she's heard a lot about him. Is Octavia (Marie Avgeropoulos) someone that Madi will be drawn to or disturbed by when they meet? I can't really say too much about that. Clarke has told Madi about Octavia and Octavia is such a badass in Madi's eyes. Clarke has told Madi about Octavia.